A world away from Brewster Place, yet intimately connected to it, lies Linden Hills. With its showcase homes, elegant lawns, and other trappings of wealth, Linden Hills is not unlike other affluent black communities. But residence in this community is indisputable evidence of “making it.” Although no one knows what the precise qualifications are, everyone knows that only certain people get to live there—and that they want to be among them. Once people get to Linden Hills, the quest continues, more subtle, but equally fierce: the goal is a house on Tupelo Drive, the epitome of achievement and visible success. No one notices that the property on Tupelo Drive goes back on sale quickly; no one questions why there are always vacancies at Linden Hills. In a resonant novel that takes as its model Dante’s Inferno, Gloria Naylor reveals the truth about the American dream—that the price of success may very well be a journey down to the lowest circle of hell. Gloria Naylor’s Linden Hills is a truly sharp and discerning glimpse into the modern-day class hierarchy embedded within black culture. Within the exploration of this quest for upward mobility and affluence, this novel featured some of the most true-to-life dialogue since Toni Morrison’s The Bluest Eye and biting social commentary that rang so insightfully and authentically that it could only be true (not to mention witty enough to make me laugh out loud at the sheer truth and reality in it). Written and set in the mid-1980s, the societal reflections here were absolutely superb, truly bordering on Southern Gothicism in the way that each explored the mores and values of this society—at times even based in the South. This element honestly made this novel and was the foundation from which the rest of the plot was built. I wasn’t expecting the Gothic elements at play here, so that was definitely an added delight. In fact, Linden Hills models itself as a play off of the classic Dante’s Inferno, with each street further and further down the hill of the neighborhood being more and more sought after, and also more and more corrupt. That was a truly clever play on Naylor’s part and lent so many added dimensions to this novel as the main characters “descended” further and further into the neighborhood. For me, reading Linden Hills was often like sitting back at home in our old kitchen 20 years ago, listening to the “grown folk” shoot the breeze and discuss their woes over Bundt cake; it felt like home, and the authenticity of the subject matter, and characters’ reactions to it, felt like warm arms surrounding me as I “descended” into Naylor’s version of Dante’s hellish Inferno with them. I’ll admit that the writing style vexed me at times, usually at a crescendo of activity near the end of a chapter. My one note of criticism here is that it read as if Naylor was trying too hard to be lyrical, and it didn’t flow effortlessly. In fact, those moments in the novel often read as disjointed and convoluted, and I had to reread several of those passages for comprehension. 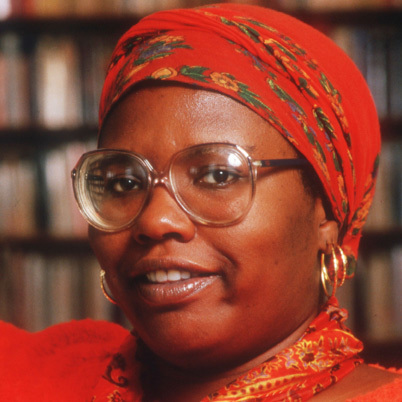 Naylor won the National Book Award for first fiction in 1983 for The Women of Brewster Place. Her subsequent novels included Linden Hills, Mama Day and Bailey’s Cafe. In addition to her novels, Naylor wrote essays and screenplays, as well as the stage adaptation of Bailey’s Cafe. Naylor also founded One Way Productions, an independent film company, and was involved in a literacy program in the Bronx. By the way, Bernadette, donations and contributions are ALWAYS appreciated and will be noted here on the blog so that other readers will know of your contributions. You can email me at navidad.thelamour@gmail.com for more details. Thanks for showing some love for Gloria Naylor and Linden Hills!